Producing video on social media has been getting easier and more popular, over the past few years. We’ve talked about how short videos are a great way to market for businesses and nonprofits, but another trend that I’ve noticed lately is how “shows” are becoming more popular on social media, too. (I mean, we were fairly on trend with Tech Thursday). These aren’t quite the same caliber as a good Netflix binge, but it’s still interesting to see the ideas people and brands are coming up with. One recent example I can think of is Kristen Bell’s Momsplaining, which she does through Ellen DeGeneres’ YouTube Channel. Each episode is only between 4-7 minutes long, they’re produced but not with a set the way Law & Order is. These video series aren’t just on Youtube. On Facebook, there are “shows” like Charlene’s World, which share fairly hilarious videos of a young girl and different personalities she’s invented including Bossy Boss Lady, Classy Jen, and Blaze. Betches just started a new web series called “Please Advise with Aleen,” which is a guide to corporate life for 20-somethings. They also have other videos that live on their website but get shared on their social media channels. It seems like from established celebrities and brands to “Joe Schmoe down the road,” the preferred new way to share not just one video but a series of videos is through social media. The fact that Kristen Bell & Ellen are sharing Momsplaining on YouTube instead of trying to make it a full t.v. show might signal that they’re trying to meet their audience where they are- on social media. In terms of social media that supports very short term video content, this article, which talks about experiments creating a Snapchat-only show and an Instagram show (back when Instagram only supported 15 second videos). Since the article is from 2016, I’m guessing the Snapchat attempt at a series wasn’t very successful (Instagram has since extended it’s video length allowance to 60 seconds). A lot of celebrities will post Snapchat stories, but it doesn’t seem like the “Snapchat series” has made a comeback just yet. Of course sometimes a web series will eventually air on t.v., like Derek Waters’ Drunk History, but for now, it seems like video series are sticking to social media for the time being. So when you have some things to say but can’t fit it in one video, consider doing a series on social media. You may be surprised at how large the audience is there… and how many other people are making series too. There’s nothing quite as unifying as humor when it comes to shared experience. Last year, when I was pregnant and dutifully reading pretty much everything I could to prepare for the new baby (little did I know, all that reading doesn’t necessarily prepare you for reality, but at the time it made me feel like I was accomplishing something). Along the way, I found a LOT of blogs that were helpful, but probably the number one find in terms of both helpfulness and hilarity was Pregnant Chicken. Pregnant Chicken has multiple contributing writers, but there’s definitely a uniform “style” of writing that’s equal parts funny and helpful. For instance, they have a collection of articles on “Scary Stuff” that you may encounter while pregnant or while your baby is still young. Being able to access a sense of humor while still being serious/acknowledging the scariness isn’t easy, but the writers of Pregnant Chicken are able to navigate this balance (and add a bit of levity to things that are typically tough to talk about). They also have different giveaways throughout the year, typically the entrance “fee” is your email address, and for “extra” entries, you have to do things like share the giveaway on Facebook, tagging three people on the giveaway on Instagram, and other things that grow either their followers or the followers of the giveaway affiliates. What really got me hooked on Pregnant Chicken was their social media presence, namely Facebook and Instagram. In other words…it was the memes. As I mentioned in a post this fall about the loneliness of life with a newborn baby, it feels nice to know that other people are going through/have gone through the same thing you’re going through (it’s also a bit of a sanity check). It was a bit of a relief to see memes that were so relatable, and funny/self-deprecating- it made me think, “Okay, maybe I’m not totally terrible at this after all.” Topics include all things parenting: sleep deprivation, tantrums, phoning in household chores, diaper blowouts-the less glamorous side of things (because we love our babies, but it’s okay to have a laugh or two at the expense of a child…or yourself). Any business can benefit with the mindset of having a sense of humor and not being afraid to say what everyone is thinking…. then again, we may be a little biased about that. It’s a new year, and you may be making resolutions to improve your self/life in 2018. If you’re struggling with an idea, I can help you out- and the good news is, it’s actually really easy to do! 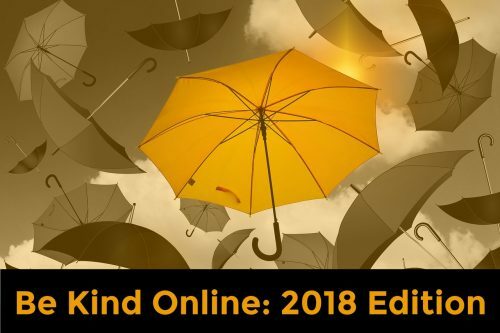 Here it is: Be a little nicer online. The internet has become a pretty open arena for sharing experiences and opinions, especially social media. It’s also become fairly common for people to put each other down (okay, that’s probably a euphemism). Be respectful of others “space.” Nicole talked about the questions she asks herself before posting something online in a blog post “Manners on the Move.” One of her “rules” is not tagging photos or checking in somewhere without a person’s consent. Everyone has their own gut checks for social media, which is fine, just remember to be respectful of how others choose to be present online. It’s easy to ask for permission if you’re going to write about someone on a Facebook post, even if they don’t have Facebook. Recently someone wrote a post about my 80 year old grandmother on Facebook, and she found out through one of us grandkids. It wasn’t negative, but she wasn’t really thrilled about being written about by a close friend of hers without knowing about it. In the below Instagram post, Whole-30 founder Melissa Hartwig explains her personal metrics for sharing on her personal social media accounts: “Does it feel gross?” We all have our own views on what feels “gross” to post, so it’s a fairly universal metric. Think of ways to be helpful instead. One example I can think of is mom’s shaming other moms on baby/kid pictures. Unless someone is clearly putting their child in danger, it’s probably more helpful to keep opinions to yourself. If you want to be helpful to say, a mom who is maybe a little off in how she straps her kid in a car seat, consider sending a private message that offers actual helpful tips for correct practices. Commenting with a threat to call DHHS and have the child taken away, for example, is pretty unhelpful (and yes, this is an example I have actually seen). Quietly remove yourself from negativity. Let’s face it, we all have a friend or two on Facebook that is a total negative Nancy. You are only ever in control of your own actions and responses, so if there’s a person or group online that rubs you the wrong way, you can always remove their stories from your newsfeed. It’s basically just passive resistance- instead of getting involved in a back and forth on social media, it’s like just quietly receding into the background. Overall, I think the world, online and off, could benefit from trying to understand each other before jumping to judgments. While Facebook and other social networks allow us to connect in a more widespread way, sometimes we lose sight of what it means to connect in a meaningful, kind way. Travel three times a year. I get those aren’t SMART goals but they gave me something to focus every decision on. If it wasn’t moving toward one of those things, it either went WAY down on the list or removed altogether. As far as the first two goals go, simplifying my life involved selling many of my worldly possessions and unloading responsibilities. And that was lovely and continues to be as I look around my house and life at what else I can get rid of. Traveling three times a year was twofold of finding cheaper ways to travel (nextvacay.com is my new favorite thing ever) and making it a priority (book it already!). This year, I’m up to two trips, next year hopefully three. The ‘hardest’ one is of course number three. I promised myself this year no more catering gigs (I even gave away my uniform so I wouldn’t be tempted) so I had to get creative about money but the truth is 1) anything I do can’t take away from my businesses or work (ideally it would ENHANCE them) and 2) this income would be passive. Completely automated. The idea of this is you set it and forget it. Examples of this would be display advertising or some kind of affilate link sharing (if you have social media scheduling software that is). Moderately hands on. This could be something that needs periodic tweaking or interaction from you. Examples of this may be an online course that you respond to questions/comments on periodically or renting out your spare bedroom on Airbnb. Stolen moments. This is actually not at all passive but you can fit it in where you fit it in. An example of this would be taking a survey on Swagbucks or performing a task on Amazon’s Mechanical Turk site. Now I love those “How I Made $10,000 Blogging Last Month” posts as much as the next person, but they also make me roll my eyes. The rest of us would be thrilled with a couple hundred bucks a month, am I right? I have been spending my weekends exploring some passive income options and thought it would be fun to report back how it works for a moderately sized website run by a moderately internet saavy person who can only give very part time attention to this cause. You seem to have to pay your dues before getting the sweet gigs. As a new person on ANY of these platforms, you are going to be the low person on the totem pole, which means you have to do low paying stuff for awhile and get experience or other “cred” before you qualify for more lucrative gigs. 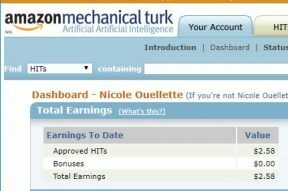 Let me now bury the lede: Amazon Mechanical Turks has earned me $2.58 for about four hours of work. I applied for this program knowing that much like Amazon Merch, because of its popularity I could be waiting weeks or months to hear back. When I got approved in five days, I was excited to be let into this very exclusive club. Note: I am not sure whether my website creds, my amount of Amazon ordering, some combination of the two, or other factors got me approved. Amazon doesn’t share its criteria but no doubt big data knows a lot about us. I will say this system does feel pretty gamified, from the timer that runs as you complete tasks to the ‘pending’ and ‘approved’ statuses of your submitted gigs. So if you enjoy that kind of thing and don’t mind working on it awhile, something like that kind of gig marketplace would be good for you. We might be able to say the same things about Upwork, Fiverr, and other online gig platforms. In short, you still have to build up a reputation before people throw money at you. If it seems to good to be true, it is. Don’t be jealous of me for my roughly $0.06 USD in bitcoin money I made over the course of 6 hours. So I’ve been looking at bitcoin for a couple months and thinking the idea is pretty neat. This episode of Fresh Air is a really nice primer on cryptocurrency if you aren’t familiar and not at all boring. 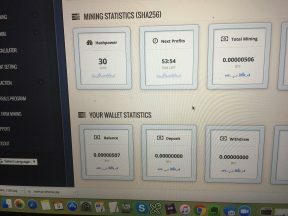 Since I personally was unsure about buying hardware and software (or I guess more accurately, knowing how to maintain it), I began looking into cloud mining, which is basically where you use someone else’s equipment (which you can run from your computer) to “mine” for bitcoins (which are being slowly released into the world and will cap out at a certain number). What’s the catch, you ask? There is a minimum amount to withdraw (to save the zeros and put it into understandable US dollars) of like $20… and when you run it you make about $0.01/hour. And you read websites about people getting stiffed on payments so it leaves you to wonder if you really want to invest hundreds of hours in something before knowing if you’ll get a payout. Most people in the space say this is “worth it” if you have access to cheap or free electricity OR you just buy Bitcoin and hold onto it, like stock. In other words, too good to be true is just that. One “dollar” is not equal to $1 USD. So Swagbucks is a survey taking company that promises you three swagbucks or fifty swagbucks (some amount anyway) that you can earn and cash in. (Note, that is an affiliate link so if you try it, I get three swagbucks). I am a smart person and I keep thinking 3 SW is like $3 USD. It is not. Approximately 300 SB is redeemable for a $3 Amazon gift card. (Different gift cards have different discounts). In other words, you got to get a lot of SB to get real money. You make the most (and easiest) money referring stuff (ie being an affiliate) but a good program is like a unicorn. The most passive of passive income that generates real money is affiliate ads. Now if you look at his earnings graph even from two years ago, affiliate is not the majority so it represents a shift. There are tons of affiliate programs out there, but finding one that pays enough to be worthwhile can be a needle in the haystack situation. On our end, we’re adding our affiliate links to our social media rotation, our email template, and a few other places and will monitor results. If we add up my weekends of work, I made somewhere between $0.01 and $.50/hour. I have also been going through and adding a few ads to some of our better performing blog posts (I started this three days ago). Kassie wrote a post previously about Google Adsense so head there if you want to get a good primer on this. So looks like we’re making $0.02 and $0.04/day which makes a whopping $7.30 to $14.60/year. I could similarly add Amazon Affiliate links (which I’ve started doing) to give us 3% of purchase price and probably make around $30/year in very passive income. Remember, I’m not starting a brand new site with no traffic so this would be harder if I was only getting a couple website visits a day. But you get the idea. Truly passive income doesn’t pay well unless you have a TON of traffic. Income that is less passive pays better but you have to put in your dues. That said, some money for “nothing” is better than no money for nothing. Pick your poison, my friends. Because I want you to make money, but having made less than minimum wage for a month, I hope this post makes you feel better for not being an instant success. You’re too smart for that and now, I am too. I have always had a bit of a sweet tooth. In fact, I’m pretty sure all of my adult teeth are actually “sweet.” Unfortunately it’s not possible for me to physically be at all the bakeries I’d like to (and there are so many to choose from around here), so that’s why I follow them all on social media. The benefit is that I get to see delicious cupcakes and other goodies on a daily basis, even if I can’t physically make it into the store. Another benefit, which we’ll get into more in a bit, is that I’ll sometimes make a special trip to a bakery if I know in advance that they’re going to have a certain goodie there. Based on some of the bakeries I’ve seen online, I’ve noticed a few things that bakeries do in their marketing to get people in the door. Online Order or Inquiry Forms. One simple thing bakeries can do is set up a form on their website to take orders. For instance, if you get a lot of pie orders around Thanksgiving, you can create a simple form to let people know what your flavor options are. You can also use it as a way to filter out what you do and don’t offer (i.e. you only do chocolate, vanilla, and carrot cakes and nothing else) as a way to cut down on inquiries. Obviously, for those that do custom ordering, it’s difficult to implement a form to cover the infinite options, so instead you could do a general, initial contact form so that you know the person is looking for a marble cake for their cat’s 5th birthday. Sweet Sensations Bakery/3 Dogs Café has a good system on their Specialty Cakes Page. Galleries/Albums. I remember going to Hannaford and flipping through their birthday cake album that they had on the stand by the bakery and planning pretend birthday parties (…for myself). While it’s a little trickier if you do a lot of custom work, you can offer galleries of your past work to showcase what you’re capable of doing so potential customers can get an idea. For instance, Cakes Downeast showcases cakes after they’re made on her Facebook page. Price Points & Offerings. Another idea for offering people as much information as possible before they contact you is to create a page of price points and offerings on your website. 3 Dogs Café is a great example of this on their website. For instance, on their bakery page they have a table of cake flavors, sizes, and the prices (with information about how many each size typically feeds). Marketing Scarcity… “Limited supply” is one way to make people flock through the door FAST, especially when it comes to cookies. One thing that I’ve seen bakeries do (that totally works on me) is announcing when they’ve made something that they don’t usually make, AND letting people know that there is a limited supply (i.e. one batch/one cake etc). It also works as a way to test a new product. For instance, after seeing this cake, I considered driving to Bangor to grab a slice (tragically my schedule didn’t allow it). …And Regularity. Most places have at least a few staple products that are always available, like coffee, bagels, etc. While getting people in the door for goodies you make occasionally is a good tactic, it also helps to let people know what they can expect on a daily basis. Of course it can be hard to keep up with posting social media while you’re also trying to run a business. 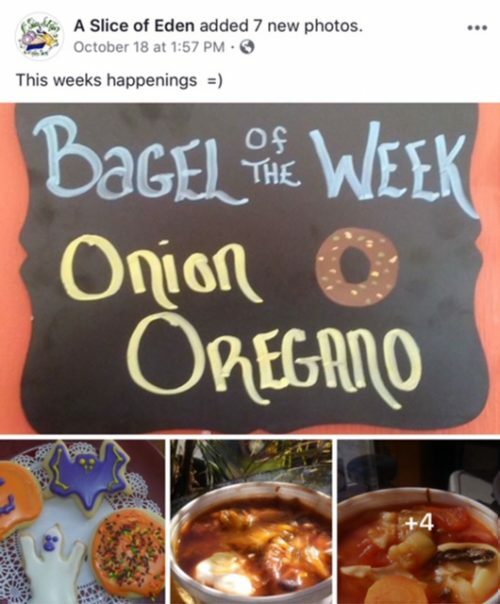 A Slice of Eden in Bar Harbor has an interesting solution-by posting their soup and bagel of the week, and anything else to expect. Speaking of regularity, making sure business hours are up to date on social media is key. Many bakeries are early to open/close, and people are more likely to stop in on their way to work if they know you’ll be open during their commute. 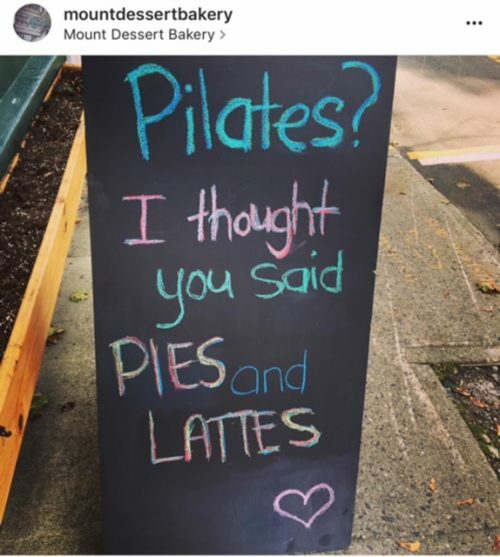 And whatever you do, remember to have fun, like our friends at Mount Dessert Bakery! Whether you run a bakery (or just stalk them online like I do), here’s hoping this post gave you some ideas… and maybe an excuse to get your favorite carb at your favorite local bakery. Note: If you are on or near us, Gift MDI has a very useful blog post about the best $5 carbohydrate you can get at every local bakery. I didn’t realize how lonely the first month after having a baby really is. 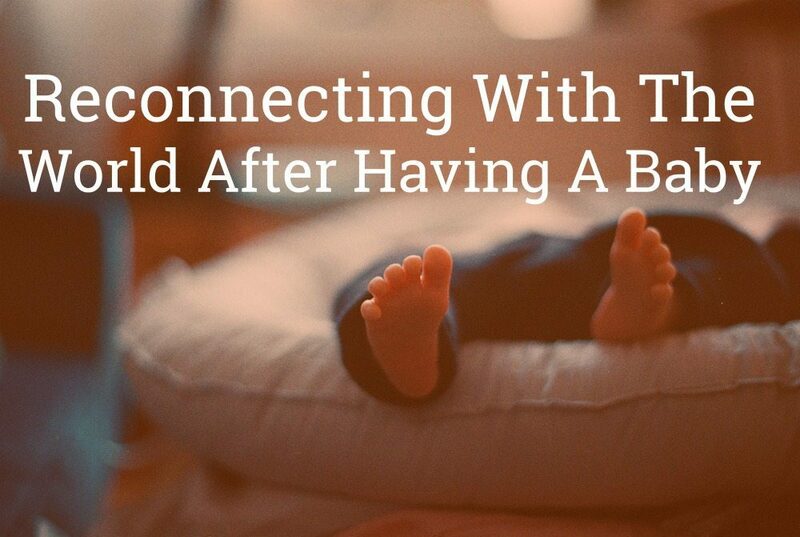 Sure, you have the company of the baby, but for someone who is used to being around other people on a daily basis and having some form of adult human interaction, it can be a shock to the system (in addition to the other stuff that comes with having a baby, which I won’t go into here). While it has gotten considerably easier to find our groove over two months, a huge part of my rediscovered happiness has been found online. In addition to streaming a lot of Bravo and Netflix, and consulting Dr. Google at least once a day for 4 weeks, the internet has actually helped me step into my new role. Without being as cliché to say “find your tribe,” there can be a sense of “these are my people” when you connect with the right groups/people/apps. There’s no judgment. Mom-shaming is real, and from what I’ve seen it tends to come from other moms. The mom groups I like participating in are honest and not critical of each other’s parenting choices. I won’t go into detail my feelings about this, but when people come to a safe space to vent or genuinely ask for help, the last thing that makes them feel “connected” is getting criticized. It’s honest. The groups I like are the ones that really capture the “win some, lose some” essence of everyday life. It’s not always Instagram worthy, but it’s still nice to share. For instance, one mom had gotten glammed up, just because, only to have her kiddo spit up all over her outfit. Some days I work out in my living room in baggy t-shirts and boxer shorts. The point is we don’t take ourselves too seriously. It feels like a conversation. After all, that’s why I sought out online groups in the first place. The best groups encourage others to post and it’s not all dominated by one person (but there usually is some sort of moderator who keeps things going if needed). Events on Facebook. Another way to stay connected is looking at the events on Facebook. One of my friends actually pointed out Emlen Family Doula’s new Postpartum Support Group that meets every first and third Sunday. Without Facebook, I never would have known about this delightfully local and incredibly relevant/helpful event. You can search events locally, by event “type,” and Facebook will also let you know if you have a few friends interested in a nearby event (which may or may not feel a little bit creepy). This example is more of an intersection between online and “real life” but it helped me feel connected to other people in a meaningful way. Hobbies. For me, working out has always been something that brings me joy. Using the power of the internet to read blogs from some of my favorite fitness people (Hungry Runner Girl, Carrot’s N Cake) helped me feel someone connected again. That, and I was able to stream some easy post-partum workouts to get my endorphin level back up before getting the doctor’s clearance to resume a more intense program. For other people, connecting with a hobby online may mean perusing through Pinterest or writing blog posts of their own. Entertainment. My postpartum period was not all productive (actually a small percent of it was). Most of it was spent catching up on Bravo TV, checking out some new Netflix shows (American Vandal satisfies my love for true crime and comedy). Another source of entertainment was Instagram. There are a lot of funny/absurd memes about parenting- and complete randomness- that ate up more of my time than I’d care to admit. Strange as it may seem, these memes actually made me feel connected to the outside world because it helped me remember that it everyone struggles- but sometimes you just have to laugh about it. Turn it Off. Honestly, sometimes it’s all a bit overwhelming and you just have to step away from your phone or computer. Maybe make some tea, go outside for fresh air, read a book…we all need a break every now and then! Sometimes the most important connection to focus on is the one with yourself. I’m happy to slowly be reconnecting with the world, online and off… and I hope this post helps at least one other person do the same.